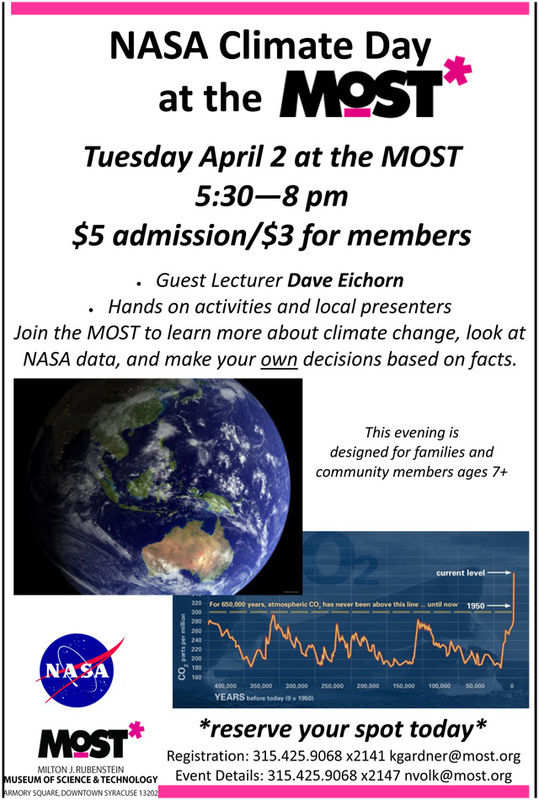 I’m pleased to announce that The MOST is hosting a NASA-sponsored Climate Day on Tuesday, April 2nd. The combined indoor/outdoor (hopefully outdoor, if the skies hold) event includes demos and lectures on NASA’s Global View of Climate Change, understanding the differences between Weather & Climate, mini-Green House demonstrations, and Ocean Salinity. And, while everyone else considers our changing climate indoors, a few CNYO members will be hosting a solar observing session on the Creekwalk just North of The MOST (at the same location that the Syracuse Astronomical Society hosted the Venus Transit session on 6 June 2012). A google map of the proposed location (centered in the map between West Fayette and Walton) is provided below (The MOST is located just below the bottom of the map). There will be more information to follow (esp. for CNYO organization) as the event draws near, but we’ll be looking for a head count of available solar scopes (and solar scope operators). The first flyer from the MOST is reproduced below. Banner image at top: Snow Cover and Sea Surface Temperatures – With an albedo of up to 80 percent or more, snow-covered terrain reflects most of the earth’s incoming solar radiation back into space, cooling the lower atmosphere. When snow cover melts, the albedo drops suddenly to less than about 30 percent, allowing the ground to absorb more solar radiation, heating the earth’s surface and lower atmosphere. Credit: NASA. Read more at www.nasa.gov/centers/goddard/earthandsun/climate_change.html.